I have a thing about zippers. And it’s more than just a thing, it’s pure disdain. But this echino laminate sat in my fabric stash for years, waiting for the perfect project. And it turns out all reasonable contenders for the perfect project involved zippers. 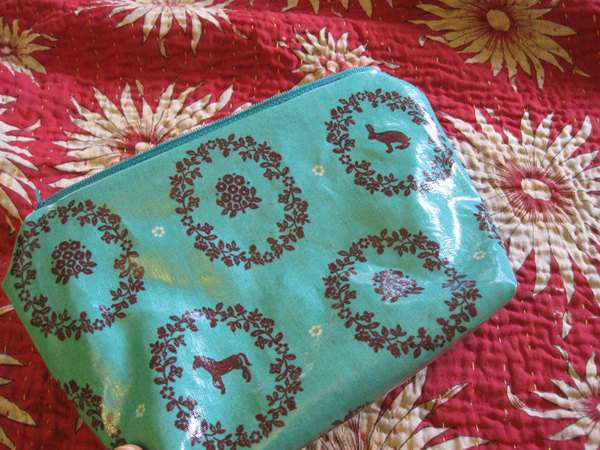 So with Christmas nearing and my younger sister having commented more than once on this neat fabric, I decided a little zippered pouch for her was in store. It was a simple project made from a 9″ zipper and four 9″x”6 rectangles (2 exterior fabric pieces and 2 lining pieces) sewn together with the bottom corners squared off to create depth. Maybe it was a little too simple. After sewing the zipper in place with no problem I felt like such a champion that I finished up the rest of the clutch, snapped some pictures, then wrapped it up and presented it to my sister on Christmas. Christmas evening she unwrapped it, smiled and then tried to open it. And then she tried again and again…. and again. It opened eventually, but just not easily. 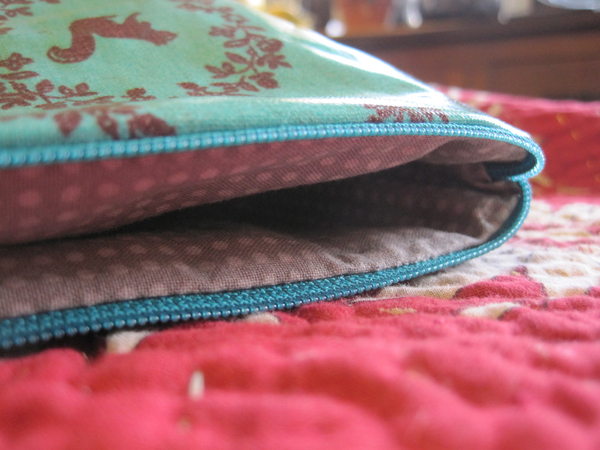 In my rush to mark a zippered project off my list, I had skipped some crucial steps — steps that I know, but just didn’t think about. Steps like top stitching along the zipper to keep the interior fabric away from the zipper teeth. I’d kind of like to blame this problem on the zipper, but I can’t. This one is all on me. Luckily, I think I have just enough fabric left to make a functioning replacement for my sister. In the meantime she can at least look at it. This echino laminate is lovely, at least. What have been some of your gift making and gift giving failures? I have never even attempted a zipper, so unsure am I of how they actually work. Would it be crazy to try and repair the zipper in the current bag? It’s super cute – I love the laminate. I’m sure Arielle was appreciative nonetheless. Remember the mermaid Halloween costume I tried to make for Evelyn when she was 1? I really blew that one, and wasted some lovely fabric. I could totally try to repair the bag, but if there’s one thing I hate more than zippers it’s fixing a project. Apparently I place a lot of restrictions on projects, eh? Also, I’m amazed you even attempted a costume like that with no sewing machine. I bet, even as a disaster, attempting to dress a one-year-old as a mermaid could be pretty cute.